News Update: “Vallejo commission names six structures as city landmarks” at March 17, 2016 hearing. In 1860 Vallejo’s founder, John B. Frisbie, chartered a sailing ship to export another kind of California gold—wheat! Grown near Vallejo, this was the first shipment of wheat sent overseas, from California to Liverpool, England. Nine years later, Captain A.D. Starr established Vallejo’s first flour mill in South Vallejo in 1869. Flour shipped from Vallejo would eventually travel to Asia, South America, and Europe. 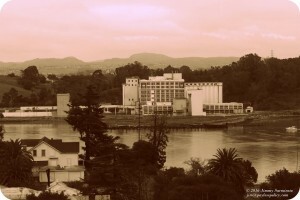 Vallejo became the largest flour-shipping site in California. The mill was purchased by the Sperry Flour Company in 1910 and later became the General Mills Sperry Division. We can be proud that this mill shipped flour all during the two world wars. It finally closed its doors in 2004. The mill and the other Vallejo industries dumped petroleum, asbestos and anything unwanted into the river and bay. We are faced with two choices: Ignore the evidence and imagine that any business and any jobs are good for Vallejo – or – stop the madness, clean up the mistakes, and build businesses that really are good for Vallejo. 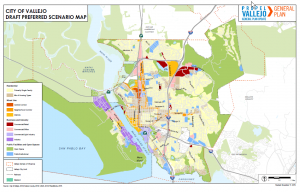 The General Plan Working Group (GPWG) has been developing an update to Vallejo’s General Plan since January 2014. Consulting with Placeworks, general plan specialists, and with input from the public, a Preferred Scenario representing Vallejo as a River and Bay City was presented to our City Council at a special meeting March 1st and accepted unanimously with slight, but important changes. This allows the GPWG to continue working towards a visionary plan for Vallejo’s future. The VMT/Orcem proposal, however, will continue to be considered under the current general plan and zoning for intensive use. The Preferred Scenario presented to the City Council represented a compromise between the GPWG who wanted public access all along our waterfront, and the City Attorney, needing to protect the interests of the project applicants and other businesses along the waterfront. when we defeat VMT/Orcem. That property will then go back to the GPWG for changes to the zoning. if the Kiewit Corporation directly north of VMT/Orcem would agree to move to another location. Informally we have heard they are open to this possibility. 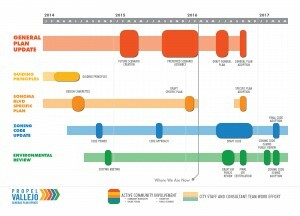 According to the Propel Vallejo timeline posted here, a Draft General Plan is expected in June. The Final General Plan Update will be voted on by By City Council in October 2016. Staff and a sub-group of the GPWG are reviewing zoning, which should be completed in early 2017. The next important meeting is March 17, 2016 held by the Architectural Heritage and Landmarks Commission regarding 790-800 Derr Street Certificate of Appropriateness 15002 7—a request by the Vallejo Heritage Foundation (VAHF) to determine that seven historic structures are eligible to be City Landmarks and to add them to Vallejo’s Historic Resource Inventory. The seven structures being considered are associated with the former Sperry Flour Company and include (1) an administration building, (2) the flour mill, (3) garage, (4) grain silos, (5) the Manager’s house, (6) barn and (7) historic dock. VMT/Orcem wishes to demolish most of these structures along with the old wharf while sparing the administration building. People should write, email, attend the hearing and speak in support of historical status. We must treasure our waterfront on the Napa River / San Francisco Bay and sensitively remodel the area for all to enjoy. To read more: Propel Vallejo. The history of the Sperry mill is closely tied to the history of Vallejo, They used to bring clipper ships through with grain in their holds. 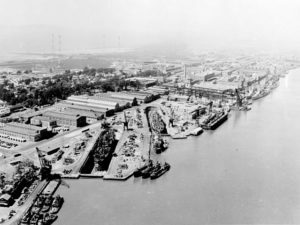 Founded by A.D. Starr in 1869, what became the Vallejo General Mills plant in 1929 began as Starr Mills and later Sperry Mills. It was, “in point of capital involved and employment afforded, the most important industry in Vallejo, besides being the biggest mill in the state,” according to the Vallejo Chronicle dated Thursday, Dec. 24, 1891. The State of California owns the property, which is placed in Public Trust, with the City of Vallejo serving as Trustee. It is partly on tidelands, which rise above and fall below the mean high tide water line. When General Mills left, Cherokee Brooks took over the lease. When they left, Bank Midwest took over in 2010. VMT took over the lease on September 28,2012. The principals are listed as Blaise Fettig of VMT; Ken Dawson, president of Marcel Carter Investments; and Mark Grisham of Grisham + Associates. It was amended to extend the term of the lease from January 1, 2014 until 2047 – 33 years – with a renewal option for an additional 33 years until 2080. The annual rent is $95,520. Capital improvements are allowed to offset rent up to $8 million. Another amendment, dated September 17, 2015, allows rent abatement until June 30 2016 ‘to reflect the time required to receive regulatory approvals for the planned improvements.’ This means no rent has been paid and rent will only become due starting July 1, 2016 unless the abatement period is extended.